Help us honor our veterans in both services. 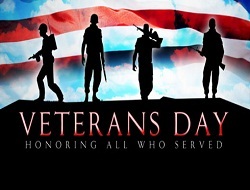 Please bring in a picture of your veteran (in uniform if available) or active military personnel. Add the name, branch, and dates of service please so we can recognize them on that day. All photos MUST BE TURNED in on or before Wednesday Evening service November 8th.